I’ve been neglecting my Breakfast Hunt for a while. I’ve pretty much settled on two options for the moment, either R10 breakfast at Beleza or breakfast at the Neighbourgoods Market. However, a short notice breakfast appointment for 8am on Saturday morning forced me to try something new (Beleza & the market only open at 9). We needed to go somewhere in or near Greenpoint as time was tight and I had heard about a funky new place called Miss K’s. It is located just after the old 0932 (if you’re going toward town). With all the development happening on this section of Main Road, I think it’s going to become a very popular strip. Miss K is getting in there early with a few other places and I think it will pay off big time. I started with a coffee, which was great, my friend had the chamomile tea (no green tea on offer, that’s not very Cape Town). For breakfast I had the Miss K breakfast (R42) which was basically an english breakfast including sausage and mushrooms. The eggs were done perfectly, soft yolk but the albumen completely cooked. The bacon was crispy, which I also like and the sausage was tasty. I would say it was a very good breakfast. Although at R42 is also one of the most expensive. My dining partner helped herself to the muesli and fruit bar. The fruit was of a high quality and very fresh, and the homemade muesli with yoghurt was of an equal standard. Items from the muesli & fruit bar are priced by weight. In this case, the cost was R42 (strange coincidence). Also quite pricey, despite the high standard. While we were seated, the staff were filling up the pastry display with some delicious looking pastries. Everything looked very tempting, but we resisted the temptation to purchase anything to take away with us. There is also a lunch time ‘buffet’ a la Melissa’s. The decor at Miss K’s is really funky and modern, but the light colours (white and light blue) make for a relaxing environment. There are several tables outside for al fresco dining, but road noise can make dining inside quite appealing. The staff, including Kirsten (Miss K) herself, were friendly and helpful. I enjoyed the experience of dining at Miss K, but for a poor guy, like me, trying to live the high life in Cape Town, it will have to be a special treat rather than a regular breakfast spot (along with Manna). looks like a lovely place… and the food sounds delicious. not sure i’d spend that much on breakfast, though – except for the most special of occasions (in which case i’d probably be savouring the delectable eggs benedict at the Uitsig River Cafe… mmmmm… now those are perfect eggs). might pop in for coffee, though – no one seems to know how to make decent cappuccino, so I’m always on the hunt. What about Origin in Greenpoint? They tout themselves as experts on all things coffee, have you tried their cappuccinos? best cappuccino…. olympia Cafe in Kalk bay! 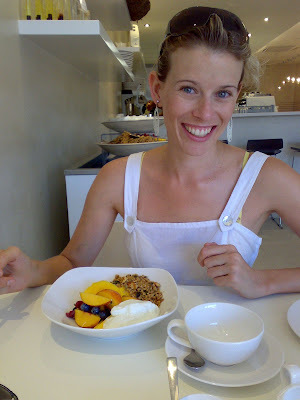 Miss K is a nice spot for breakfast – definitely better than the breakfasts from Kauai next door. Good staff and food, although as you say the prices are a little steep. Not sure what the lunch is like. Don’t waste your time in Miss K. I ate there and after paying R90 for a plate of food, this is lunch not dinner..my Sister got a tip of a latex glove in her sandwich and did not even get one of the two co-onwers (who were both present) to come over qand apologise…It was disgusting and after we eventually flagged down the one of the owners she explained the importance of wearing gloves in the kitchen, she was very unapologetic and pretentious and because of her disgusting behaviour I will never go back..its a pity really they have potential, But is will not support anything that affect that managers pocket…so good luck!! *sigh* when will restaurants learn? When a customer complains, do whatever it takes to sort it out. For the cost of replacing a meal, they have lost 2 customers and tainted their name with the many others that hear your story. Some people have a strange way of thinking. I had breakfast at Miss K yesterday morning and it was great. Two people ordered the eggs benedict and I ordered the chilli eggs, which was 2 poached eggs on ciabatta with a blob of chilli on them. The eggs were awesome, the service was fine and the coffee was fantastic. Prices have gone up, the breakfasts are mostly around R46 now. I rate Miss K as a good option for breakfast unless you’re on a tight budget. I eat at Miss K’s quite regularly – about twice a month. Although the food is good ( but not cheap ) the service is pretty ordinary – with the exception of the ever helpful Romy. At breakfast – after the staff take your initial order you are going to have to beg or fire a distress flare if you are wanting to order anything else. Maybe they are acknowledging what a lot of other posts have alluded to – their prices are so high they don’t expect you to be able to afford anything else! Unless the waitrons modify their ‘ho hum, what do you want’ approach Miss K may well find customers drifting off elsewhere or accepting that one cup of whatever you ordered is all you are going to be able to persuade staff to serve you with. I had breakfast at Miss K again the other day. I had the Miss K breakfast again and it was good, but not unbelievable. The poached eggs were excellent and the bacon was crispy and the pork sausage was tasty. The mushrooms were dry and the grilled tomato sour. I also tasted the hangover breakfast which is egg on a base of canneloni beans and chorizo, it was excellent but I don’t know why they don’t serve it with toast. The price of the Miss K breakfast has gone up to R50, which makes it one of the most expensive. The coffee was good, but I’d like it stronger. The service was fine, although the waiter does disappear for protracted periods. The place was really busy, so it has a nice vibe. I’d recommend breakfast/lunch there as long as you’re not on a tight budget. If you like being ripped off, then this is the pace to go to. A few years back I joined a friend for breakfast. No vegetarian breakfast on the menu. But OK, I asked for what my friend was having, just minus the meat. When the bill came I was charged more. Why so? My meal was a “special” meal. Oh, and this was the owner I was dealing with. Guess where I will never, ever go again. I decided to try Miss K’s after hearing about the place on KFM94.5 – they raved about the corn bread. I decided to try it. Everything else was wonderful – the corn bread was far too ‘short’. Lots of it, though – so you get your money’s worth – but after one slice (and you get two), I’d had enough. Maybe try and make it a little less crumbly?